Description: This unique ceramic tumbler offers great value. 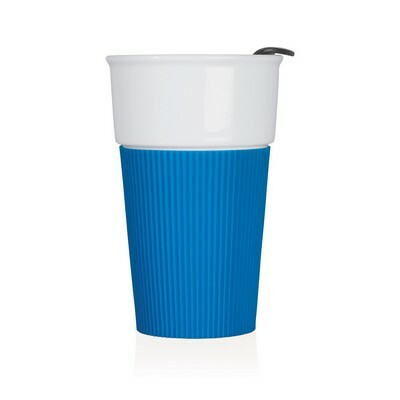 Use it without the lid like any other ceramic cup in the home or office.. then in the car with the lid. Of course, the more it`s used, the more it`s seen; which means greater logo visibility and a better return for your client`s promotional dollar. The push-in top with sliding closure provides a tight, splash-resistant seal and the colourful silicone grip is not only comfortable to hold but it also protects the ceramic from impact. Oh.. and it looks fantastic! Logo is printed on the ceramic area above the sleeve. Colours: Blue. Materials: Ceramic/Silicone. Decoration Method: Pad Print.